GLENDORA – A memorial service is planned this weekend to honor the memories of two homeless men with deep roots in Glendora who were stabbed to death earlier this month. A memorial service for John “Little John” Welch and Warren Blagrave, both 52, is scheduled for 2 p.m. Saturday at the Church of The Brethren, 151 S. Glendora Avenue, according to Nicolette Wingert, founder of the Glendora-based organization of Nurses For Christ, which is organizing the event. The friends were fatally stabbed Aug. 15 at a carwash in the 200 block of Route 66, where both had been spending their nights in recent weeks, according to friends and investigators. Welch and Blagrave were each stabbed more than 20 times in the early-morning attack, according to Los Angeles County District Attorney’s officials. Investigators later in the day arrested 28-year-old Drew Alan Friis of Glendora in connection with the double-fatal stabbing. He had been charged with two counts murder, and prosecutors also allege the special allegation of multiple murders, making Friis potentially eligible for the death penalty. A decision regarding wither the death penalty will be sought in the case has not yet been made. A motive in the knife attack has not been released. Friis was scheduled to appear in Pomona Superior Court for an arraignment hearing Oct. 3. Wingert said members of Nurses For Christ, which regularly provided meals to Welch, Blagrave and local homeless people and gave Welch with his last meal, are still having a hard time coming to grips with the double-slaying. So the volunteers who tried to make sure Welch and Blagrave had a quality meal each day are now working toward providing the men with a proper burial. Donations collected at Saturday’s memorial will be used for the funerals, Wingert said. Any extra funds collected will benefit other local homeless people. For more information, contact Wingert at Nurses For Christ at 626-315-7392. ARCADIA — A man robbed an Arcadia dry cleaning business early Wednesday, officials said. The crime took place about 9:30 a.m. in the 100 block of South First Avenue, Arcadia police Sgt. Vaugn Whalen said in a written statement. The robber entered the business and demanded money from an employee, he said. The employee handed over about $50 from the register and the robber ran from the store. He was last seen getting into a a white, four-door Honda sedan, which headed south on First Avenue, Whalen said. It was unclear if he was accompanied by a getaway driver, or drove the car himself. No weapon was seen during the robbery, the sergeant said. The robber was described as black, about 6 feet tall, wearing a black shirt and white pants. Anyone with information was asked to contact Arcadia police at 626-574-5150. WALNUT – A young man died early Wednesday after being struck by a passenger train in a commercial neighborhood in an apparent, authorities said. The man was struck by an Amtrak train shortly before 6 a.m. along Valley Boulevard, just east of Pierre Road, Los Angeles County sheriff’s Lt. John Saleeby said. He was pronounced dead at the scene. The man’s name was not available Thursday. He was initially described as an Asian man of between 18 and 20 years old. Initial reports indicated the death was a suicide, according to Amtrak spokeswoman Vernae Graham. It appeared the pedestrian lied down and placed his head on the tracks prior to being struck. “Everything looks like suicide,” Lt. Holly Francisco of the Sheriff’s Homicide Bureau said. The investigation was ongoing, however, and an autopsy was planned by coroner’s officials. No injuries were reported to any passengers or crew aboard the westbound train, which was just about to complete the Sunset Limited route from New Orleans to Los Angeles when the pedestrian was struck, Graham said. The train left New Orleans Sunday. The incident took place on a section of track bordered by Valley Boulevard on one side, and businesses and fencing on the other. There are no crossings in the immediate area. The exact speed the train was travelling was unclear, she said, however the speed limit for that section of the route is 65 mph. Graham said the train was delayed for a little more than three hours before resuming its journey. ANGELES NATIONAL FOREST — Detectives are investigating the discovery of a body along a hiking trail in the forest north of Altadena Sunday afternoon. A hiker reported discovering the body, initially described only as male, shortly before 4 p.m. to the east of Inspiration Point, Los Angeles County sheriff’s Lt. Brian Fitch said. Officials located the body about 4:10 p.m.
Few details were available, as communications in the forest were limited, Fitch said. It had not yet been determined Sunday afternoon whether the death involved foul play. ONTARIO — Coroner’s officials Sunday released the name of an elderly Azusa man killed in a motorcycle crash in Ontario early Saturday. Richard Robledo, 78, died at a hospital shortly after the 9:40 a.m. crash at Euclid Avenue and the 60 Freeway, San Bernardino County coroner’s officials said in a written statement. He had just made a left turn from Euclid onto the freeway when his motorcycle collided with a pickup truck, coroner’s officials said. The cause of the crash was being investigated by the Ontario Police Department. 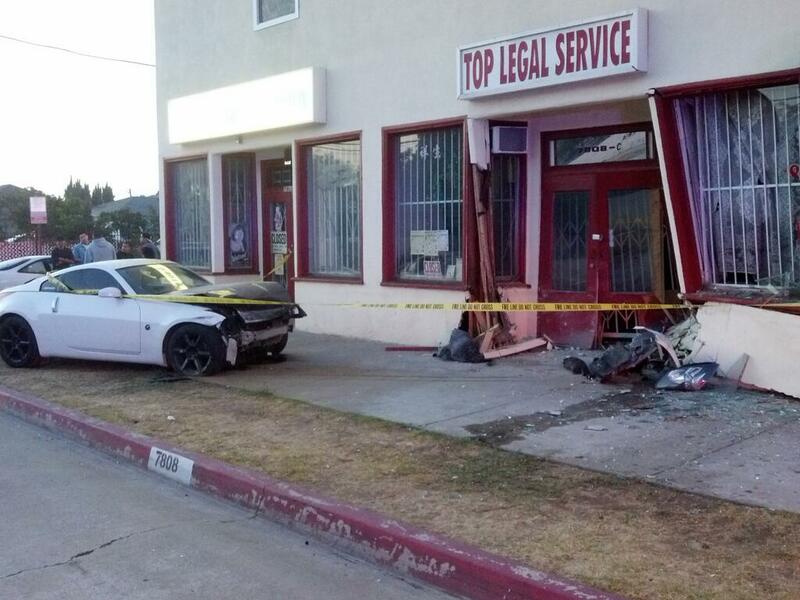 ROSEMEAD — A car slammed into a Rosemead legal office early Sunday, causing significant damage but no injuries, authorities said. A man in hiss 20s was driving a Nissan 300ZX when he lost control and struck a legal office on Hellman Avenue, just east of Del Mar Avenue, Los Angeles County sheriff’s Sgt. Michael Martinez said. The business was closed at time and no one was inside, he said. The driver of the car was not hurt. The cause of the crash remained under investigation, however driving under the influence of alcohol or drugs was not initially suspected, Martinez said. A building inspector looked over the damage and determined it was safe for the legal office to remain open pending repairs, officials said. PHOTO courtesy of the Los Angeles County Sheriff’s Department. PASADENA – Two police officers suffered minor injuries and three people were arrested after party-goers started fighting with police early Sunday, officials said. Tomas Fonseca, 18, and Xitlalic Ramirez, 18, were booked on suspicion of felony resisting police following the scuffle, while 21-year-old Jose Sanchez was accused of misdemeanor resisting police, Pasadena police Lt. Jason Clawson said. Their cities of residence were not available. Police responded to a report of a fight involving about a dozen people at a part in the 1000 block of North Raymond Avenue, he said. The caller reported one of the combatants was armed with a handgun. Two officers arrived at the party and found no one fighting, Clawson said. A handgun was not found. “Several subject began arguing with the police, and ultimately a fight ensued,” Clawson said. The officers both suffered cuts to their hands during the melee, and one officer suffered a bruise to his head, he said. Additional officers arrived at the scene and the three suspects were arrested, Clawson said. According to Los Angeles County booking records, Fonseca and Ramirez were being held in lieu of $25,000 bail each pending their initial court appearances. Sanchez was released from jail on $10,000 bail pending his initial court date. PASADENA — No one was wounded when someone opened fire on a home early Sunday, authorities said. The shooting was reported about 1:35 a.m. in the 100 block of Poplar Lane, Pasadena police Lt. Jason Clawson said. Three adults and a teenager were inside the home when an unknown attacker or attackers shot at it, the lieutenant said. No suspect description was available, and a motive in the shooting was unclear. PASADENA — A transient robbed an elderly Pasadena man of his wallet before being chased down and tackled by a good Samaritan late Saturday, police said. Richard Ray Duncan, 21, is accused of robbery following the 7 p.m. crime in the 3600 block of East Foothill Blvd., according to Pasadena police officials and Los Angeles County booking records. Duncan approached an 81-year-old Pasadena man as he exited a grocery store and was getting into his car, Pasadena police Lt. Jason Clawson said. The robber forcible took the man’s wallet from his pocket. “The victim attempted to struggle for the wallet, but was overpowered by the suspect,” Clawson said. As the robber fled with the wallet, “A passer-by gave chase and apprehended the suspect,” he said. The good Samaritan tackled Duncan and held him until police arrived, Clawson added. A description of the good Samaritan was not available Sunday. Booking records indicated Duncan was being held in lieu of $50,000 bail pending his initial court appearance. A motorcyclist died and two people were arrested early Sunday following a hit-and-run crash on the 60 Freeway at the 605 Freeway, authorities said. The fatal collision was first reported about 2:40 a.m. in the westbound lanes of the 60 Freeway, just east of the 605 Freeway in an unincorporated county area near Industry, California Highway Patrol Officer Ed Jacobs said. The name of the motorcyclist was not released by coroner’s officials pending notification of his family. CHP officials described him as a 28-year-old Walnut man. Arrested were Ai Ho, 57, of Rowland Heights on suspicion of hit-and-run, as well as Gilberto Flores, 25, of Los Angeles, on suspicion of hit-and-run and drunken driving, California Highway Patrol officer Jennifer Cassidy said. The motorcyclist was riding a 2012 Yamaha motorcycle at a “high rate of speed” in the No. 3 lane prior to the collision, California Highway Patrol officials said in a written statement. He rear-ended a 1995 Lexus SC300 being driven ahead of him by Ho at about 65 mph, officials said. “As a result of this collision, (the motorcyclist) was ejected into the No. 3 lane while his vehicle continued travelling westbound,” the statement said. A 1997 Chevrolet Tahoe being driven by Flores then came upon the scene and struck the motorcycle, according to the CHP. Paramedics pronounced the motorcyclist dead at the scene, Jacobs said. The Lexus and Chevrolet that were involved in the crash had fled the scene. Investigators, aided by a license plate that fell off one of the vehicles during the crash, located the cars in Rowland Heights and Los Angeles, and the suspected drivers were arrested, officials said. According to Los Angeles County booking records, Ho was being held in lieu of $50,000 bail pending her initial court appearance, while Flores was being held in lieu of $100,000 bail. Officials issued a Sig Alert on the westbound 60 Freeway for more than two hours following the crash.